Why didn't Japan's First Lady speak to Trump? 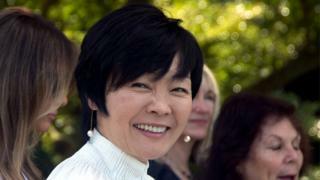 Japan woke up with surprise on Friday morning to see the intense scrutiny of its First Lady's proficiency in English. It followed US President Donald Trump's comment, as part of his broad-ranging New York Times interview, that the wife of the Japanese prime minister, Akie Abe, cannot speak any English. When netizens discovered the YouTube video of her giving a speech in English, however, they went on to speculate that she must have pretended to not know the language to avoid having a conversation with Mr Trump. His critics treated her as their hero and American media have taken an intense interest in the story. But the truth may not be as black and white. While the president's remark that she cannot even say "hello" may be an exaggeration, being able to read a scripted English speech does not mean that one is capable of having a spontaneous conversation over dinner. Her previous diplomatic encounters have almost always been through an interpreter and when the BBC requested an interview with her in the past, they said she would only accept if it is conducted in Japanese. Responding to the uproar over Mr Trump's re-telling of his encounter with Akie Abe at the G20 summit, Japan's foreign ministry spokesman told the BBC there would be no official comment, as it was a private conversation. "In the meantime, we acknowledge in that interview that President Trump stated that he enjoyed the evening with her [Mrs Abe], and she is really a lovely woman," the ministry added. But Japanese people have been weighing into the debate, and they divide broadly into three camps. Why should she be able to speak English? The editor of the Huffington Post Japan, Tomoko Nagano, asked if Mr Trump could say hello in Japanese while one Twitter user, @cevicherohack, said he finds it annoying that English speakers assume everyone should be able to speak their language. Given English isn't her first language, couldn't President Trump start the conversation? @hidezumi thought the president was impolite not to have led the conversation while New York Times reporter Hiroko Tabuchi said the issue may be Mr Trump's conversational skills, not Mrs Abe's. As a non-native English speaker myself, it took me years before feeling comfortable enough to start a conversation at a dinner party. @Riepyan agreed that it is a mistake to assume everyone would be friendly and speak to you in simple English. Japanese media have so far been neutral on the topic and just reported what has been said in American media. It may be partly because she remains a controversial figure, being in the spotlight for her role in the ongoing scandal over nationalistic schools. Whatever the truth may be, it is fair to say that no-one in Japan expected Mrs Abe to make it into the top highlights from Mr Trump's interview. Trump-Putin: Did dinner chat break diplomatic protocol?